KMAC does it again! 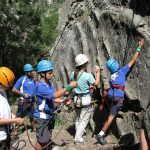 Experience Climbing the KMAC Via Ferrata – an exhilarating way to enjoy the thrill of mountain rock. 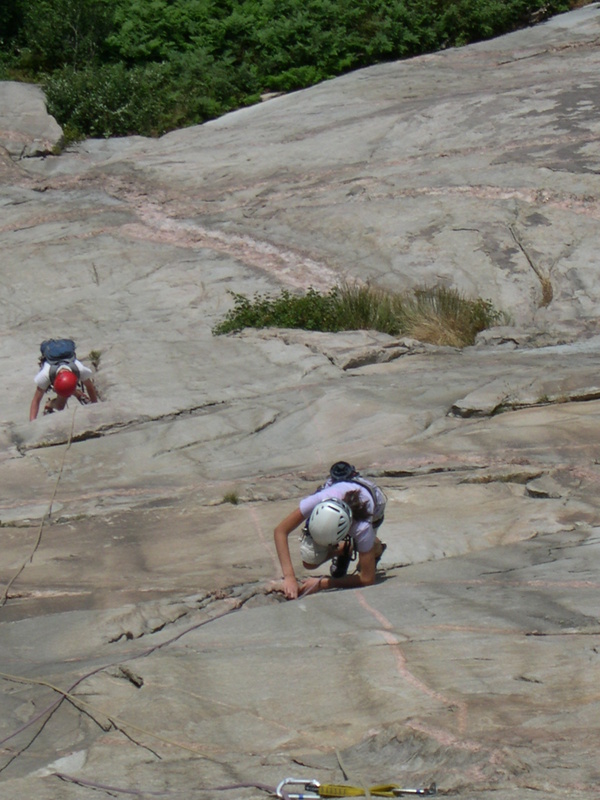 The KMAC Via Ferrata is a unique experience that falls somewhere between scrambling and technical rock climbing. While it is physically demanding, the system of cables and ladders allow even non-experienced climbers to ascend the 600 foot tall cliff. All you need is to have good fitness and at least a passing ability to deal with heights. 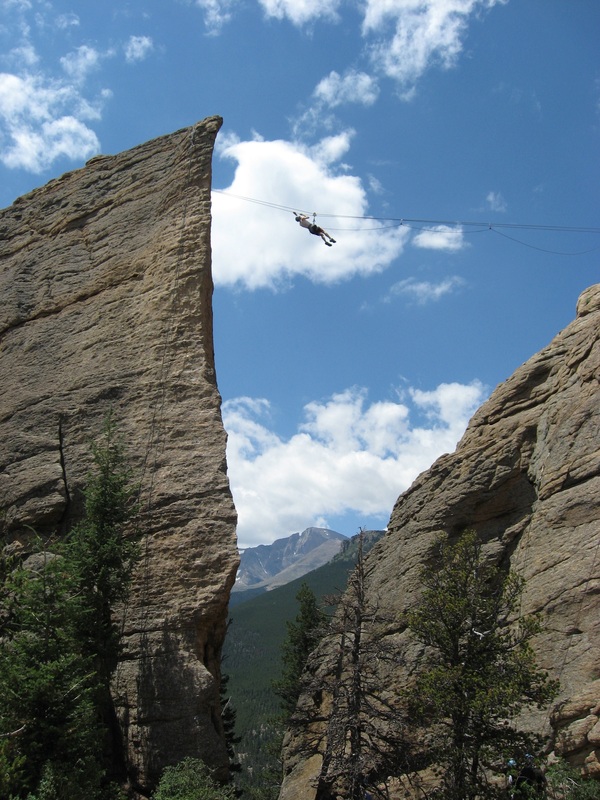 The Via Ferrata routes offer different levels of challenge and can cover up to 600 feet of vertical climbing. It is a perfect activity for building a team and group. After lunch on the summit, we descend a lovely hiking and scrambling route down through the gorge back to the base of the rock. 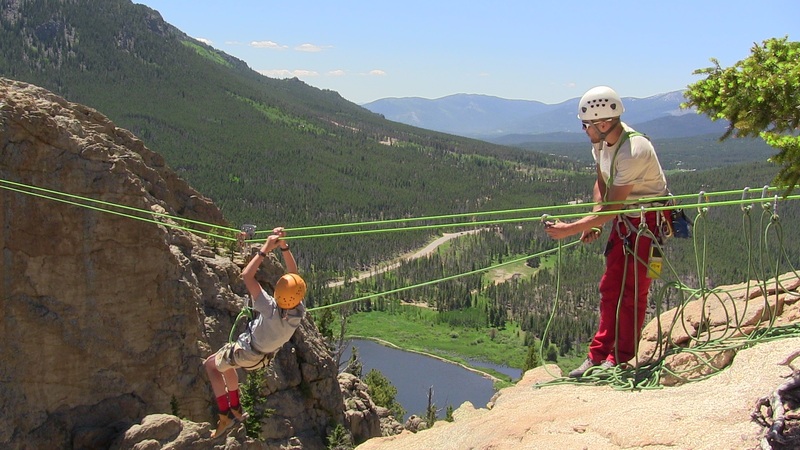 The KMAC Via Ferrata can be enjoyed by individuals, couples, families, and groups young and old. It’s the perfect way to share in a unique climbing adventure. We can even adjust the level of difficulty based on your adrenaline wishes! Please contact us if party members are below the age of 12 and we can program your outing to include them. *Please Note: Via Feratta Access is not open to the public. Users must be accompanied by a KMAC guide. The approach hike takes about 45 minutes. An average Via Ferrata tour ranges from 2 to 5 hours depending on the group size, speed of ascent, and whether we choose half or full-day. What should I bring on the Via Ferrata? A snack or lunch to eat throughout the day. 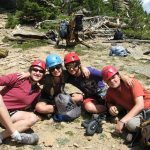 Programs range from a fun day on the rocks for the whole family to personalized private guiding in Rocky Mountain National Park. You’ll work closely with KMAC and your guide to design an outing suitable for your goals and ambitions. Private instruction maximizes your time and exposure on the rock. It is one of the most popular ways to climb with KMAC. By scheduling with a KMAC guide you will be able to custom design an outing to exclusively meet your goals. 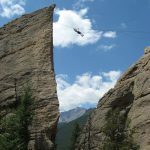 From local crags to multi-pitch climbs deep into Rocky Mountain National Park, your guide will help you to achieve what you want. You’ll talk with your guide before your outing to determine what venue options and terrain difficulty will suit your ambitions. Please call or book on-line to make a reservation. 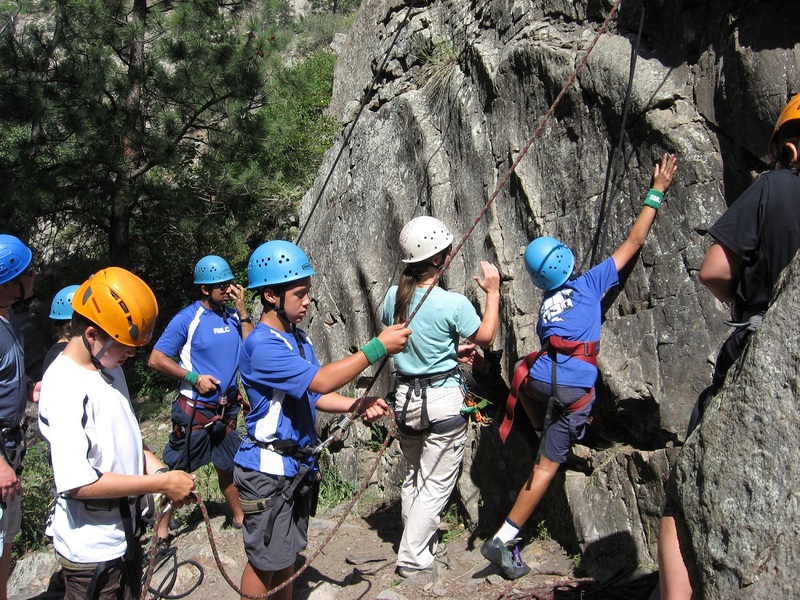 Upon request KMAC rock climbing guides are trained to provide “one on one” and group instruction for visitors with special needs who want to experience climbing. 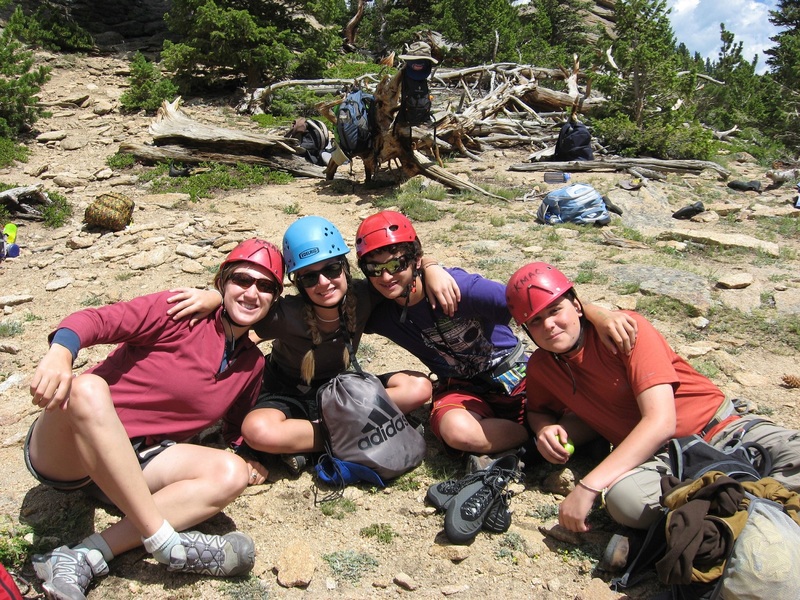 KMAC is proud to have experienced female guides on staff. 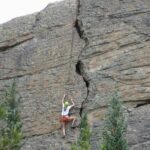 Whether you’re looking to try rock climbing for the first time, learn more about systems and techniques, or get on alpine routes in the park, we have female guides who can show you the ropes. 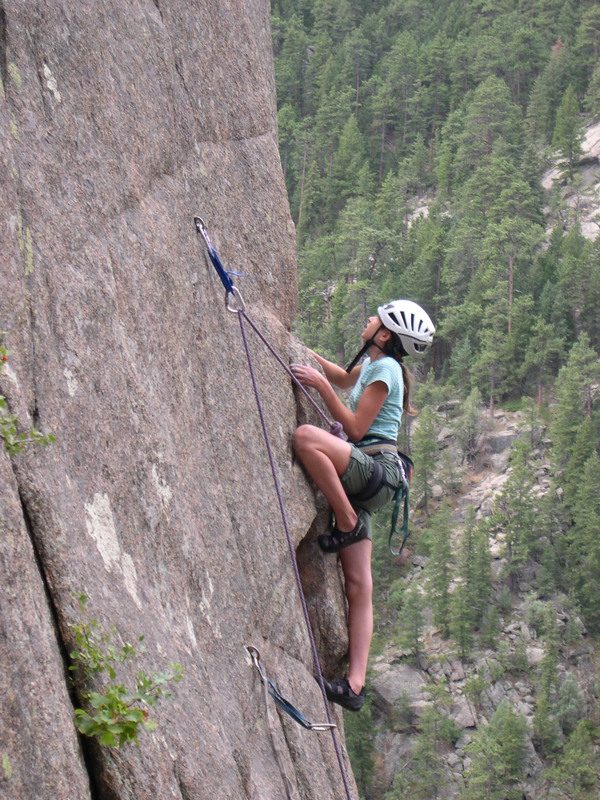 Our guides are happy to give other women the “beta” or instruction they need to feel confident on the rock. Want to learn how to crack climb? Hold on through the crux in an overhang? Lead trad? Our guides will work with you to design the perfect trip — from a 3-hour Taste of Climbing to a full weekend clinic. All you need to do is request a female instructor when booking. 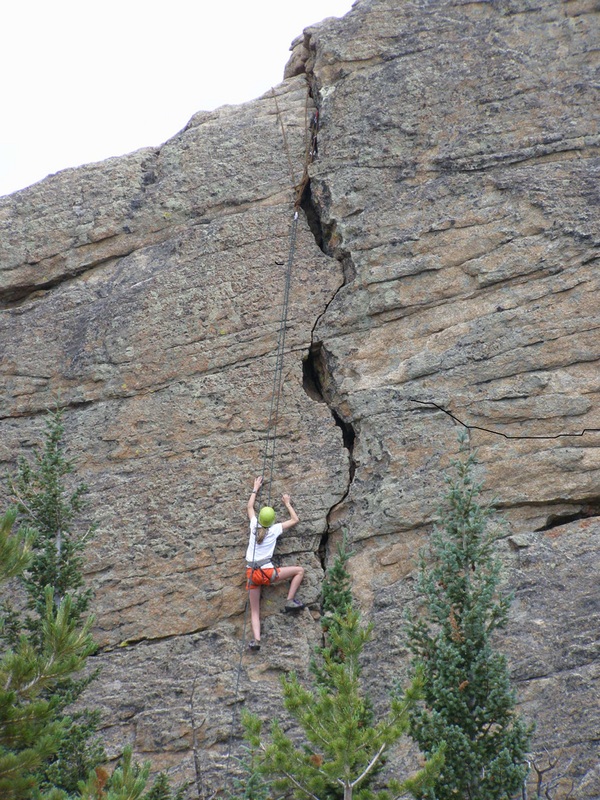 Climb at KMAC’s own private rock site or at other group venues in the Estes Park valley. 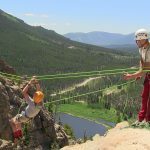 Experience the Tyrolean Traverse! Half and full day outings are available. Whatever you choose, we’ll tailor for you. These outings are about being together, learning the basics, and are just plain fun. Great for company team building, families, reunions, and wedding parties. Please contact us for group family rates and advanced bookings. The Alpine- There’s no place quite like it; the zone in the high peaks where rock and snow define the landscape. Whether it is a pure rock climb or a combination of the 3 disciplines (rock, snow, ice), for climbers there is no better way to practice our craft than in the alpine surrounded by high peaks. 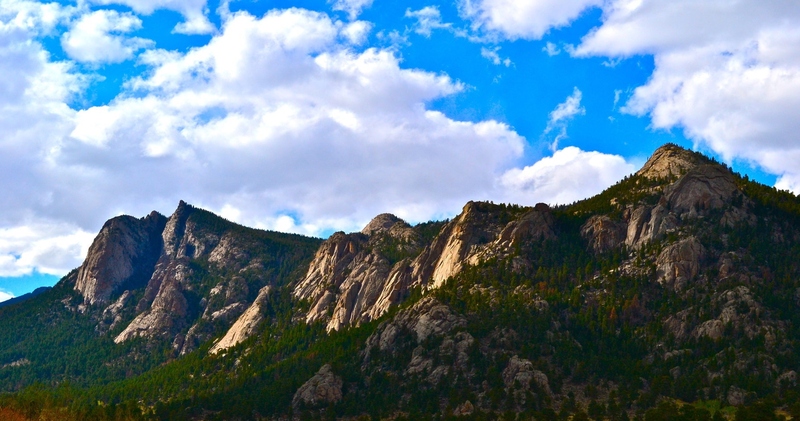 Climbers come from all over the world to climb in Rocky Mountain National Park. The climbing options abound for all abilities. From shorter classics, to longer and steeper routes, it’s all here right out our door. 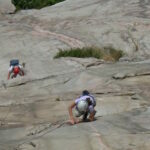 Please call for information and suggestions for your alpine climb. 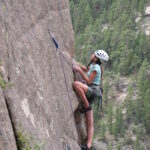 KMAC guides will work closely with you offering climbing suggestions to design your outing. Here are a few of our Alpine favorites: * Notes as one of the “Fifty Classic Climbs in North America”. 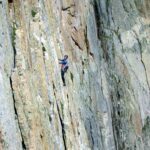 Incredible climbing, this climb is on the list of the 50 best climbs in North America for a reason. Fun and interesting features lead to a summit floating in the sky no bigger than a strip of sidewalk. Hallets North Face: Noted for its reasonable 2 hour approach to the base, this historic climb in the alpine has just about everything- Face, cracks, and wonderful stemming all in a position of unrivaled beauty. East Ridge – (5.6 – 6 pitches –): Incredible setting and very enjoyable climbing up a ridge line to the summit of a spire in the middle of one of the most beautiful cirques on earth. North East Ascent – Scrambling leads up to the spectacular traverse to the very end point of the actual Spears Head with exposure you remember forever. Sharks Tooth: 3 hour approach. Notchtop Mountain: 2 hour approach. Spiral route – 6 pitches, 5.5 – Very enjoyable outing, the climbing will never be overly difficult but the exposure will steadily rise as the valley floor recedes. Excellent first alpine climb. 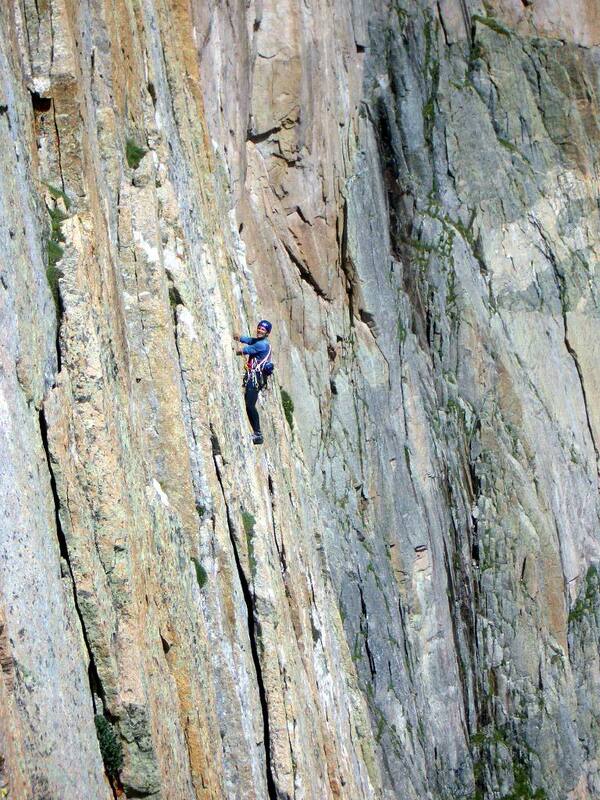 South Face – 7 pitches, 5.9 – Excellent crack climbing always in the sun and exposed. 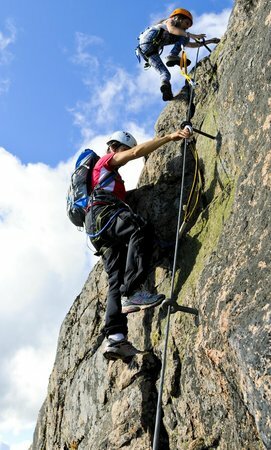 Beginner Alpine Climb, the Little Matterhorn – (4th to low 5th class): Perfect for beginners, families and young children. After a two hour hike you begin scrambling on the lower slopes to gain the Little Matterhorn ridge. We’ll follow this ridge roped together meandering from side to side as the exposure increases. 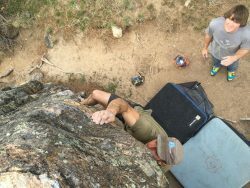 Casual Route on the Diamond of Longs Peak (5.10a – 12 pitches – 4 hour approach): A serious and committing climb, despite the name. The Diamond is one of the most coveted alpine walls to climb in America on the highest peak in Rocky Mountain National Park (14,259ft). High altitude and exposure challenge even the most experienced climbers here. When one is ready, this will be the climb of a lifetime. Deep in Rocky Mountain National Park we have found not only classic high quality climbs, but a pristine and peaceful experience. The ascent is just one part of the journey. These climbs will almost certainly offer complete in a wilderness setting. The approaches will be longer, usually requiring a long hike in (10+ miles) and bivy at the base, climbing the second day. Though hundreds exist, here are a few of our favorites that amount to a “mini” expedition: The rewards outweigh the effort. Hayden Spire: A long day of hiking and complicated off trail navigation leads to the base of Hayden Spire, deep in Forrest Canyon. Climbs from 5.4 to 5.9 lead up these remote towers. Aiguille de Fleur: An eight mile approach from the West side of RMNP leads to the impressive Aiguille de Fleur (flower tower), a remote and seldom visited fin of rock, considered the best on the West side. Seven pitches (routes range from 5.6-5.9) lead to a magical flower garden from which the name comes from. Chaos Canyon has, for over a decade, been the premier destination for summertime sending. 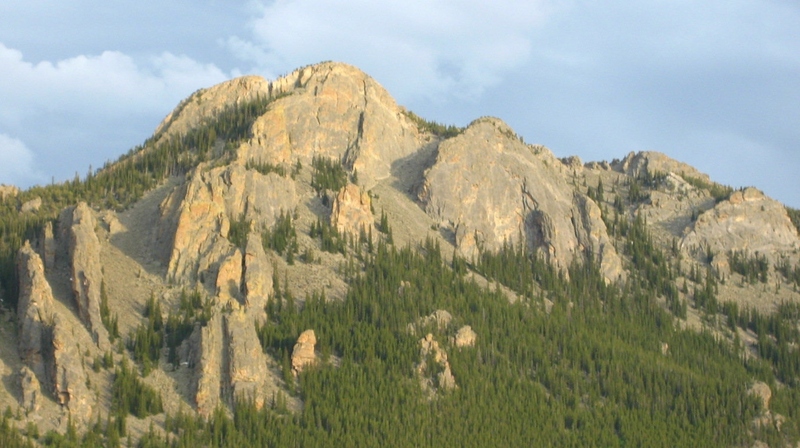 With our history in the Estes valley, KMAC has long staffed crusher boulderers. Those same climbers are now highly trained guides ready to take you into the alpine! 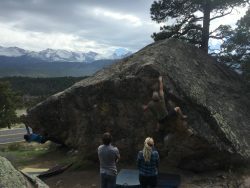 KMAC bouldering guides give you not only a highly competent mountain guide, but an expert on the area who knows move-by-move beta on all the classics. Many of our guides put up the First Ascents of problems you will try, so they have a unique perspective on the area. 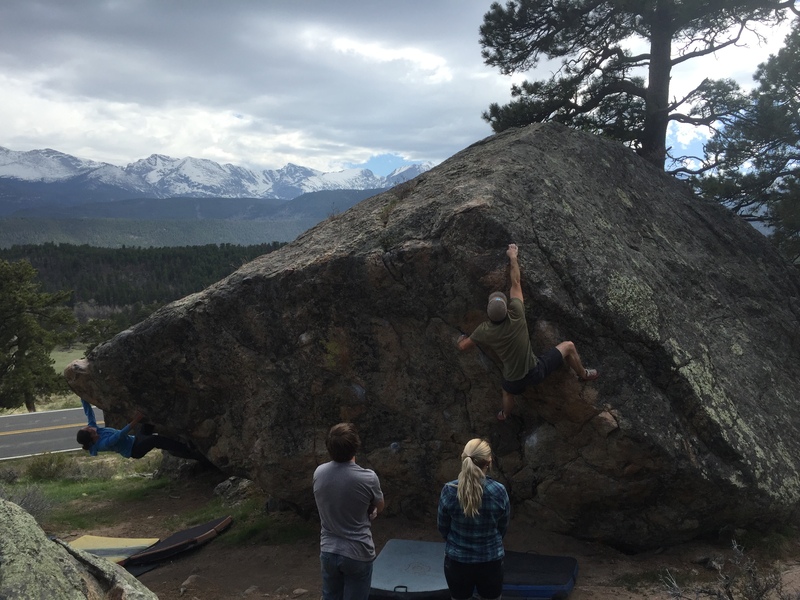 Guided bouldering is a great option for those here for a short time who want to maximize their time on the rocks with a knowledgeable guide and KMAC’s rental crashpads. 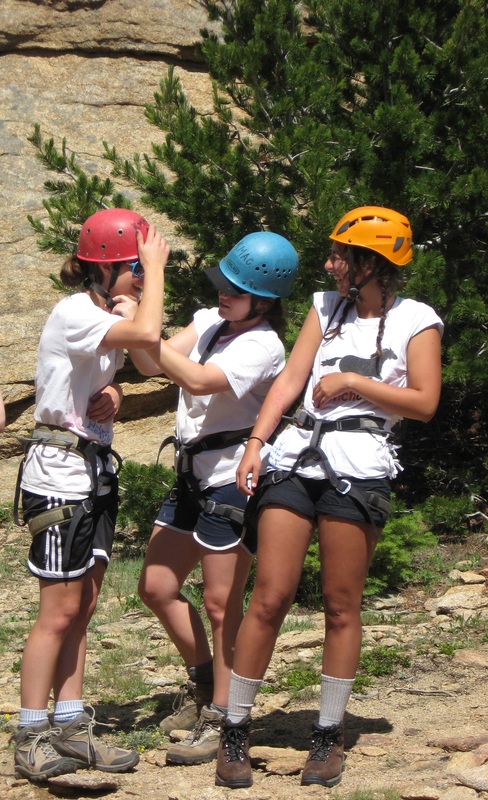 KMAC is also the perfect option for climbing teams or other groups that want a program that takes care of all the logistics of a climbing trip. We can design a course, based out of our private campground just outside RMNP, to let you have an epic week of sending. KMAC can cover everything from highly nutritious meals to transportation to enough pads to send the gnarliest highball to move-by-move beta. Contact us for pricing and options. Have you ever wondered what you’d do in the event of a forced retreat from a climb? Or worse, needing to come to the aid of your partner who needs a rescue on a climb. This self-rescue course will teach you techniques to deal quickly and safely with many situations. Often scheduled as a follow-up to the Basic Self-Rescue, this course takes off where basic self-rescue leaves off.